It’s that time again. Time to review the state of the Northern League; the wargames competition scene in the North of England. I suppose it is something of a landmark that the data below covers thirteen years of the League. 2018 saw the second year of the increasingly popular Art De La Guerre (ADLG) competition. It also saw the return of the Field of Glory Ancients & Medieval (FOG AM) competition; albeit in a truncated three round format. Thankfully the overall attendance was up compared to 2017. This is despite bad weather limiting the turnout for round one. I hope I’m not tempting fate when I say that the League looks to have regained some of its former popularity. It has certainly ceased to decline and this bodes well for 2019. In its second year ADLG was well supported with a total of 22 different teams taking part (up from 17 in 2017). On average each ADLG team played in 3 rounds (2.95 to be exact; down slightly from 3.15 in 2017). ADLG was essentially, but not exclusively, a singles competition with an average team size of 1.09. DBMM retained, and slightly increased, its loyal following and as always contributed a lot to the health of the League. On average each DBMM team played in 4 rounds (3.70 to be exact, down from 4.38 in 2017). DBMM had the most doubles teams with an average team size of 1.60. Interestingly, the average team size hasn't changed much in the last seven years. FOG AM’s return was low key and mainly based on the Manchester rounds & players. It was a singles competition with only one player attending all three rounds. Keen readers will have spotted that the 2008 & 16 figures for FOG AM have changed from the 2017 report. Both are slightly lower. This is because I decided to adjust the way I calculate the averages. Previously the average was only for the rounds held: if four were held then the average would be for these rounds only. However this year’s three round FOG AM League meant this approach would overstate the support for this game. So I have now standardized the averages over all five possible rounds. This makes the comparisons fairer. It affects the FOG AM figures for 2008 (4 rounds), 2016 (4 rounds), 2017 (0 rounds) & 2018 (3 rounds). I assume you only have data from 2006 onwards, as the Northern League was started in the 1990's? There's data from 1998 (see the link in the first paragraph). 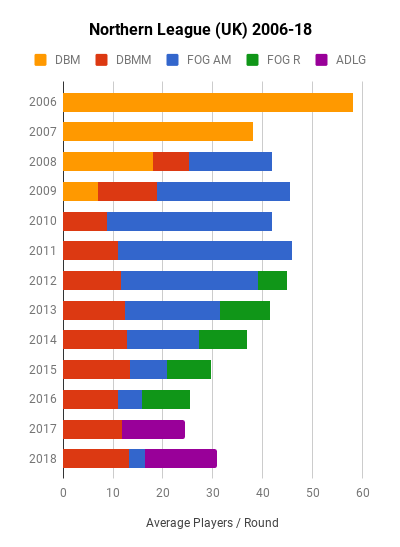 However I chose to start with 2006 because it was the penultimate year of the "pure" DBMM leagues, something of a high point and therefore a good benchmark for what was to follow.